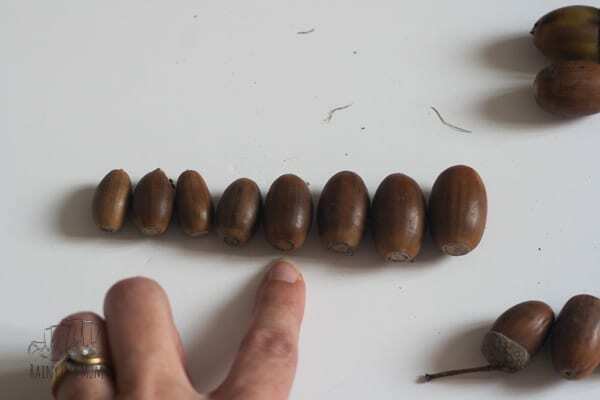 The oak trees near us are full of acorns this year – an interesting fact is that this is called a mast and happens every few years and it appears that this year is one! So for this week’s theme for Virtual Book Club for Kids Acorns and Squirrels seems to be a perfect for this time of the year. Whereas a lot of focus in Numeracy in the early years can be directed towards numbers it’s really important that areas like measuring and geometry are also introduced. In this hands-on activity with our downloadable resource to use you can work on some aspects of language as well as ordering and sorting. 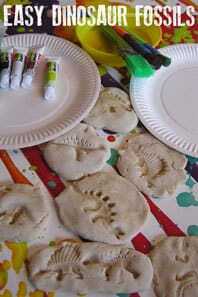 Check out this dinosaur themed ordering and sorting activity that toddlers and preschoolers will love. For toddlers and preschoolers we need to work on the language of maths, as well as the concept so here we will be using Big, Bigger, Biggest, Small, Smaller, Smallest as well as linking those with objects. We are lucky our neighbour has a large oak tree in their back garden so I asked for a bag of acorns and he was happy to provide. 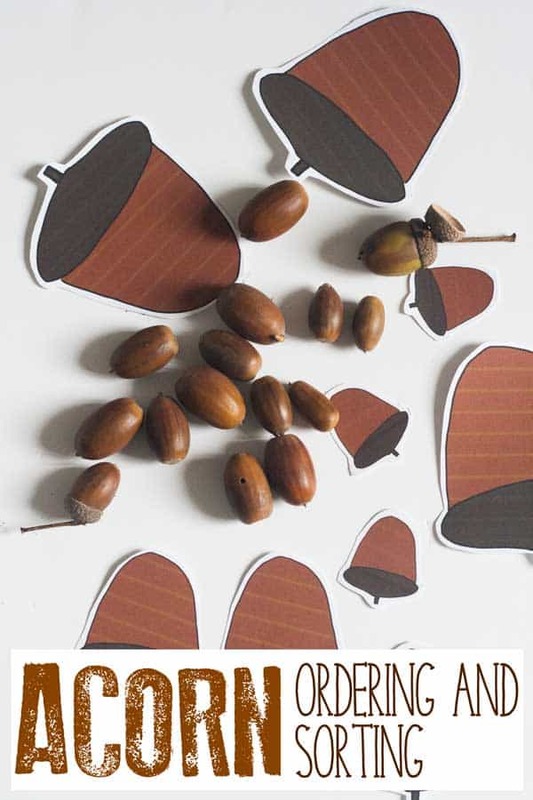 However, if you aren’t lucky to find them or it’s not a mast year and they are in short supply I have also provided you with downloadable acorn sheets for you to use with your children in this activity. 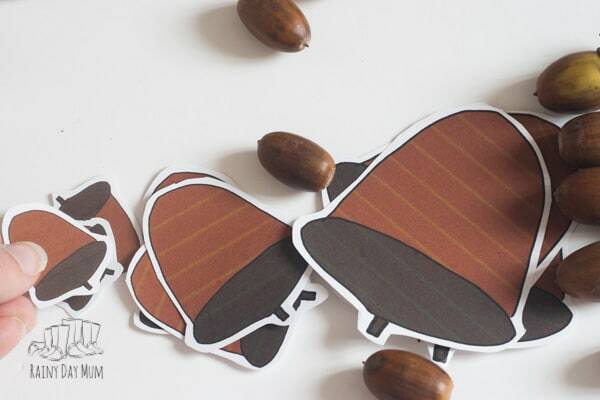 Either place a selection of different sized acorns on the table or the acorns that you have cut out. 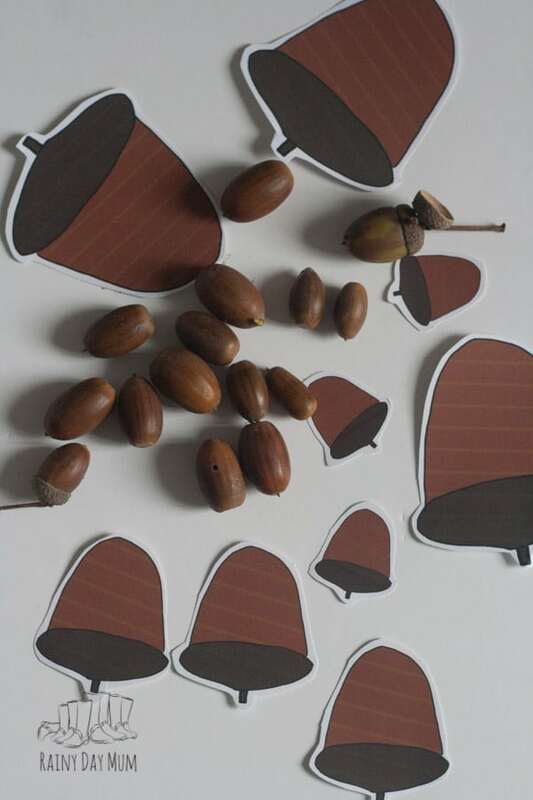 Start by working with your child to order the acorns from smallest to biggest. 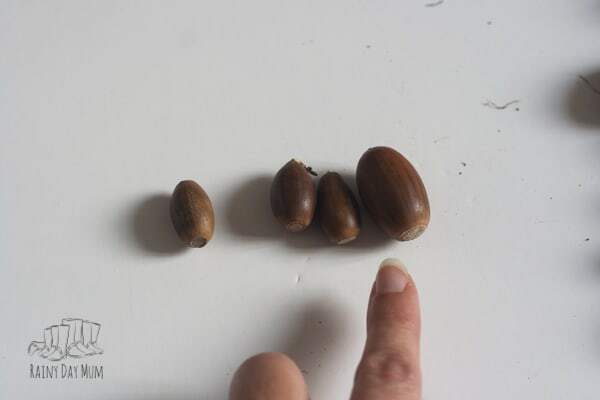 Which acorn is the smaller? 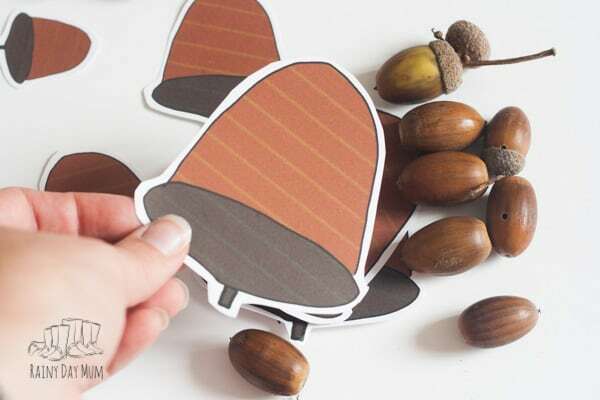 Where should this acorn go – next to the biggest one? Next to the smallest one? 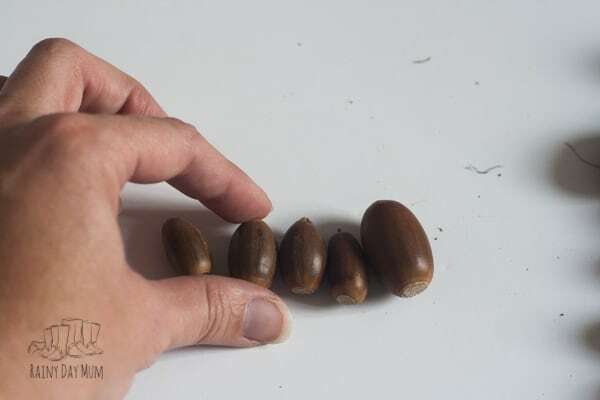 Once you have the acorns in order go through asking your child to point to a big acorn, the biggest acorn, the smallest acorn. 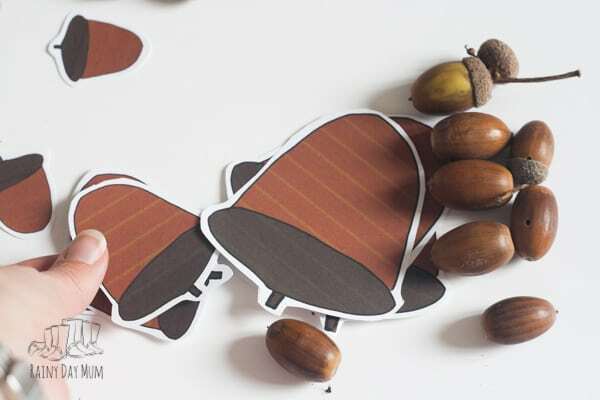 Once things are in order – now sort out the acorns into Big Acorns, Small Acorns and Medium-sized acorns. 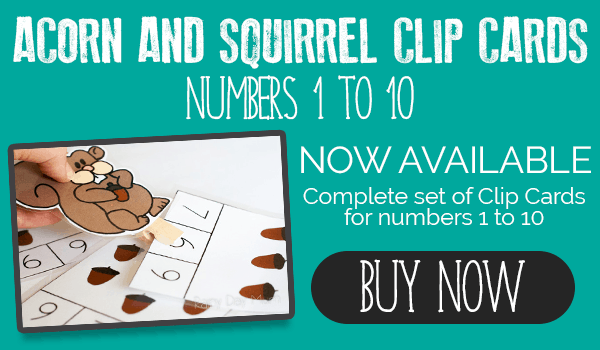 Use these Acorn and Squirrel Clip Cards to Work on Number Recognition and Counting and our Acorn Arrays to work on the basis of multiplication and times tables. 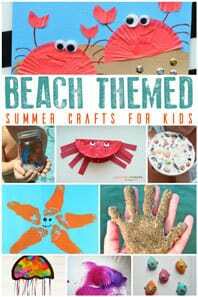 Virtual Book Club for Kids Featured Book for Acorn and Squirrel Week. 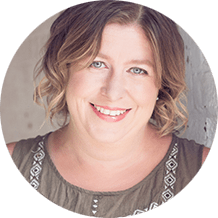 This week’s featured book for The Virtual Book Club for Kids is Scaredy Squirrel by Melanie Watt. 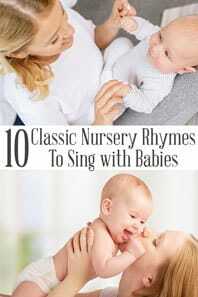 With cute illustrations and is a great one for using for more than the squirrel and acorns theme. 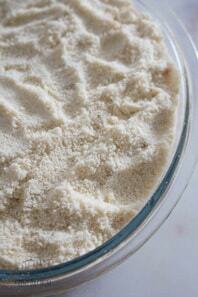 It is also great for use with children that are anxious or worried about things. 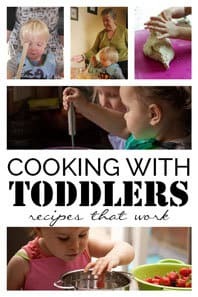 The Virtual Book Club for Kids Co-ordinators and co-hosts share themed activities every Monday with you covering all areas of skill and development for toddlers and preschoolers. Check out this week’s posts for more ideas and inspiration. 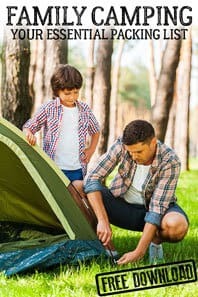 Previous Post: « Are you wearing the right size shoes? I love this idea. Perfect for my preschooler to work on these words. That’s awesome that your neighbor gave you a bunch!